How’s your week going friends? Last night I attended “Boutiques and Bubbles” which is a shopping event around St Pete with proceeds supporting the Junior League. It was so fun to catch up with my friends- and pick up a few gifts for some more people on my list! And one of the shops served cocktails in an ornament- it was the cutest ever! 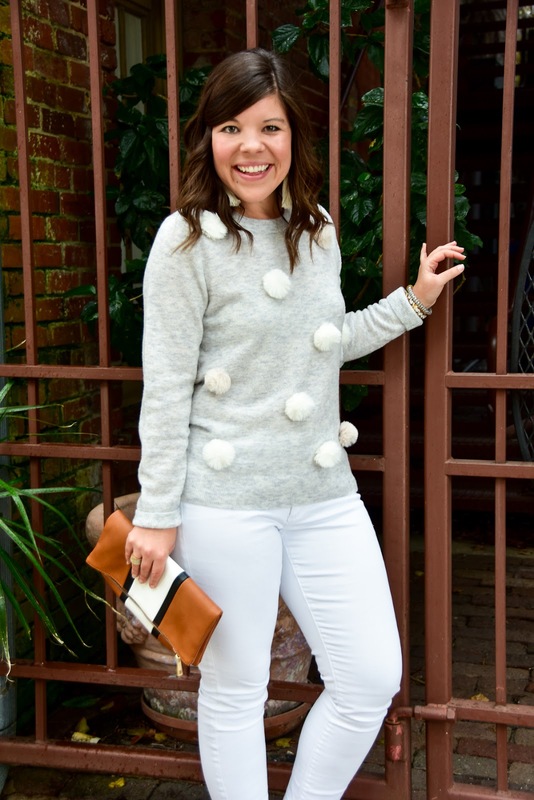 This sweater caught my eye online a few weeks ago, and I asked the girls in my office “can I pull this off? !” We all agreed it was too cute to pass up! I’m so glad I scooped it up because it has so much personality & never fails to make me smile! While I wore it here with jeans for the weekend, I dressed it up for work with a black skirt and knee high boots- and it was the talk of the office! (In a good way) 🙂 If you’re looking for a piece with personality- this is it my friends! You look so cute in that sweater! This is seriously the cutest look and so perfect for the holiday season. This sweater is too cute! Not to mention I love the title of this post 🙂 Keep smiling, girl! 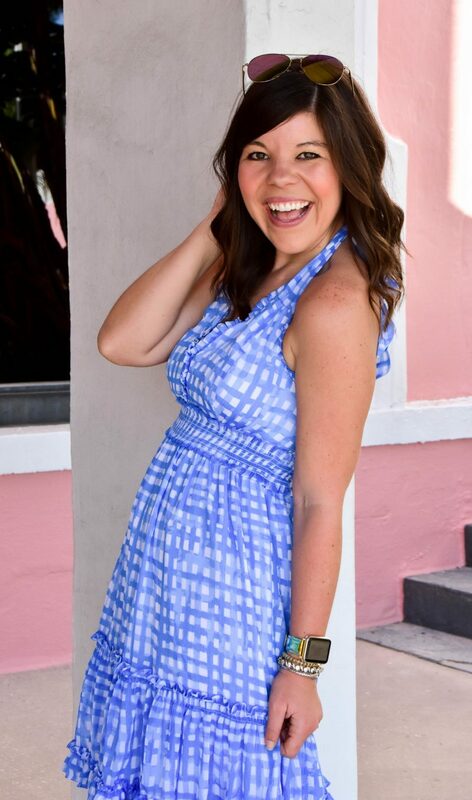 Maybe my favorite outfit you've ever posted!! Love it!! Most adorable look ever !!! 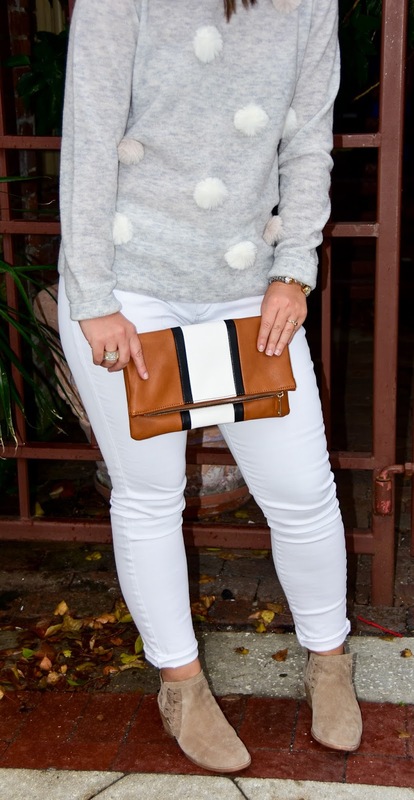 omg, this is super cute on you, and i love it with the white pants and booties! awh, such a cute and fun sweater. Love this look with white pants. Oh my gosh, the pom poms!! 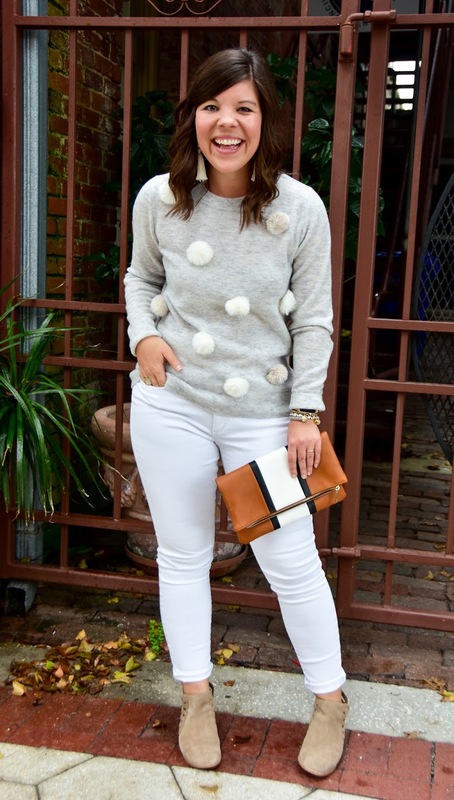 That is the cutest sweater and you can totally pull it off! OMG, this look!!! 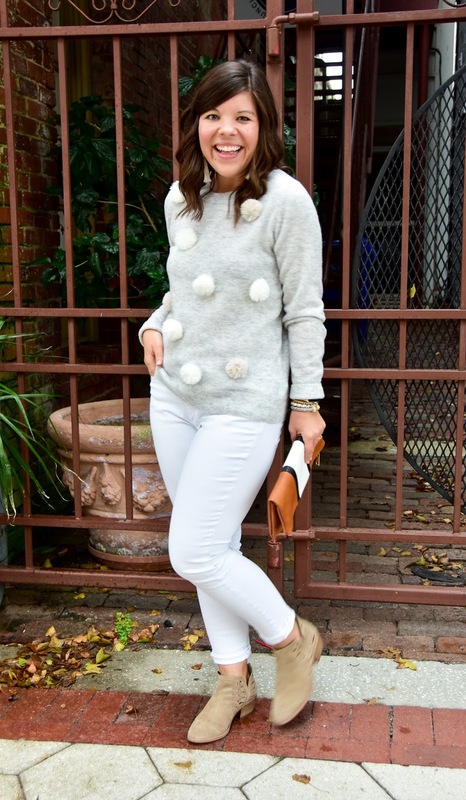 Love the soft color palette, and your sweater is beautiful!! Lovely sweater dear. Those pom poms are such a cute touch. The color is perfect for the white pants too.